× 5 = 30 Required Please enter the correct value. Thanks to the crash in oil prices this year, some of the best oil stocks to buy currently trade at a discount. WTI crude oil prices are down 30.4% in 2015 and hover just above $42. That's caused the entire S&P 500 energy sector to fall 15.4% over the same period. Oil's performance has hurt all oil stocks, including the companies posting strong earnings. But that pressure gives us the opportunity to buy oil stocks at a discount. After all, supermajors like Exxon Mobil Corp. (NYSE: XOM) and Chevron Corp. (NYSE: CVX) are down 12.1% and 19.4% this year, respectively. 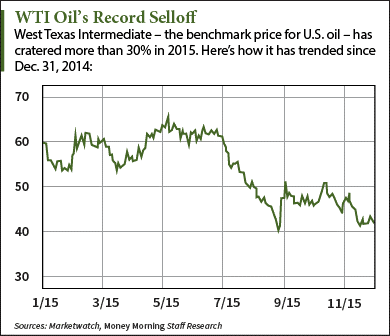 According to Money Morning Global Energy Strategist Dr. Kent Moors, oil stocks will rebound in 2016. You see, the biggest reason why oil stocks will recover next year is the wave of merger and acquisition (M&A) activity washing over the oil sector right now. The current low price environment will push the supermajors to acquire smaller firms, which will strengthen the sector and drive stock prices higher. Last April, Royal Dutch Shell Plc. (NYSE ADR: RDS.A) bought BG Group Plc. (OTCMKTS ADR: BRGYY) for $70 billion. The acquisition marked the largest energy merger in over 10 years and will create one of the largest oil companies in the world. "The Shell-BG [transaction] is the first clear megamerger option crossing the oil-gas division," Moors said after the deal broke. "We will see more of these as the new energy balance among a widening number of energy sources kicks in." Another huge merger just happened in late August. Schlumberger Ltd. (NYSE: SLB) – the biggest oilfield services (OFS) company in the world – acquired competitor Cameron International Corp. (NYSE: CAM) in a $12.74 billion deal. It's the second-largest OFS merger since Halliburton Co. (NYSE: HAL) snatched up Baker Hughes Inc. (NYSE: BHI) for $34.6 billion last year. But this M&A activity won't revive all oil stocks overnight. That's because oil prices will need to bottom out in order to move higher. In other words, prices will get worse before they get better. Although they will climb in 2016, they still won't reach the triple-digit levels they saw in 2014.